To help defray operating costs, AirportGuide.com may earn a commission for any sales placed through links on this free web site. Only during this contest, an exclusive discount code of 5% will be applied at checkout if an all-inclusive Go Los Angeles card is purchased here. The Process is 1-2-3 Easy! Choose from 1, 2, 3, 5, or 7-Day cards. Admission to as many included attractions as you want to visit for the number of days you bought the card for. Simply show your pass at included attractions for admission between 9:00am and 5:30pm. Pay nothing at the gate. 1. No purchase is necessary to enter the contest. - Be 18 years of age or older and reside in the United States. - Follow AirportGuide, username airport_guide, on Instagram. 4. Pictures with the most likes will be deemed the winner and win an all-inclusive, one-day GO Los Angeles Card smart pass. In the event of a tie, the winner will be determined by the most shares and then the most comments on the post. 5. Organizations/Corporations/Business accounts are not allowed to participate in this contest. 6. Participants grant AirportGuide permission to use any photos entered into this contest. 7. Multiple entries per participant are allowed. 8. Participants are encouraged to tag friends that may be interested in participating. 9. 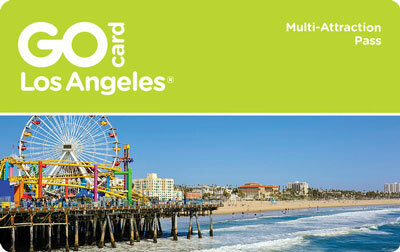 To benefit even more from the competition during the contest dates, participants can visit the SmartDestinations website and purchase an all-inclusive Go Los Angeles Card pass to get an additional 5% discount. 10. Selected winner will be announced within 72 hours of contest end and notified through Instagram DM. Instagram contest or giveaway is not sponsored, endorsed or administered by, or associated with Instagram.